Now, you might be wondering why a nice Irish lass like me didn't make the traditional Corned Beef and Cabbage for St. Pat's. Well, to be completely honest, there is no such dish in Ireland. Not traditionally speaking, anyway. Some of the restaurants and pubs over there have put it on their menus in recent years, but it's not something that they are really that familiar with. The more traditional St. Patrick's Day meal in Ireland is a boiled dinner, made with either Irish Bacon/Ham, Beef or Mutton/Lamb, with a myriad of root vegetables and tubers like potatoes, carrots, turnip, onions, parsnips and leafy greens like kale and cabbage. Actually, a boiled dinner is probably the most common lunch/dinner the whole year round in Ireland. There are many Irish people who've never even heard of corned beef, let alone cooked it or tasted it. I won't get into the history here, but here's a link to some quick information about Corned Beef and Cabbage and other little factoids about Irish and American St. Pat's traditions. St. Patrick's Day Symbols and Traditions Now... On to the food! Try not to turn the meat too soon or too often and make sure that it's in a single layer if you have more than one piece. This will ensure more even browning. When it's well browned, remove it to a platter and set it aside until you're done with the next step. Season the veggies with salt & pepper and put them into the pot that you browned the meat in. Cook them for about 6 or 7 minutes, stirring now and then, until they just start to take on a bit of color. Add the tomato paste and stir well to cover all of the vegetables. Don't worry. Your finished dish won't come out tasting like spaghetti sauce. The tomato paste just adds an additional depth of flavor and color to the meat, veggies and sauce. After the vegetables have cooked for another 5 minutes, add the beer and stir well. When the bubbles from the beer have subsided and it has reduced just slightly, add in your beef stock and the bay leaves. You should also throw in another pinch or two of salt & pepper. Remember... seasonings each "layer" or the addition of each group of ingredients, always helps to make the finished dish even more delicious! Allow this to simmer for about 5 minutes before adding you meat back to the pot. 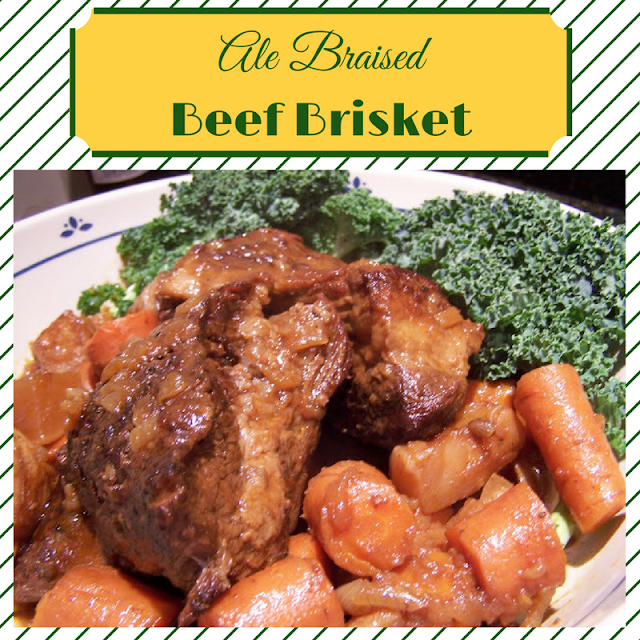 Add your browned beef back into the pot with the veggies, beer and stock and spoon a bit of the sauce over the meat. Also, move the veggies out from under the meat to the sides and on top, so they don't burn or stick to the bottom of the pot while it finishes cooking in the oven. Put a lid slightly ajar on the pot and pop it in your pre-heated (350 degree) oven. Cook for about 1 hour with the lid and then remove it and continue to cook for another hour, checking and turning the meat every half hour or so. Ovens and thickness of meat vary, so it could take a little more or less time. When the beef and veggies are tender, remove the meat to a cutting board or platter and allow it to rest for about 10 minutes covered with a little foil. Slice the brisket against the grain, in 1 to 1 and 1/2 inch slices. You can plate the meat and veggies all together on a serving platter, or you can just do individual plates for everyone. If there had been guests for dinner, I would have served everything family style at the table, but since it was just me and Hubby for dinner, I didn't go all out and we just helped ourselves to what we wanted. Don't forget to spoon some of that rich, delicious sauce (which you can serve separately in a gravy boat or small pitcher) over the meat before serving. For the Colcannon recipe, please click HERE. For the Fried Cabbage with Bacon and Onions recipe, please click HERE. 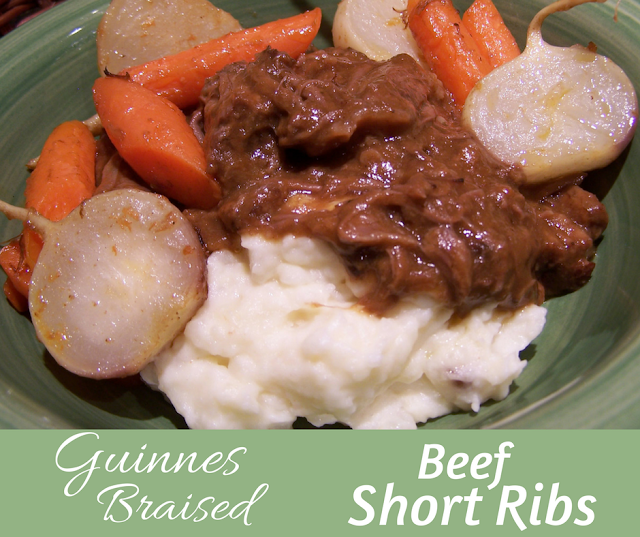 Want a great recipe for Guinness Braised Short Ribs for your St. Pat's Day feast? Just click HERE! You are making me hungry, it looks wonderful! :@) Thanks! So glad you liked it! Since I don't have fans of Corned Beef here...you've offered me a lovely alternative! This just might be Saturday night supper! This looks oh so wonderful. I think I will go get the ingredients today. Thank you for such a great tutorial with your recipe. It just looks fantastic! That sounds great! And something different from corned beef. Love the mashed potatoes, looks interesting! Liza: That's great! Glad I could be of help! Carol: Thank you! That dutch oven has got to be over 20 years old, but it's still going strong. The French really know how to make cookware! Sarah: Thank you! I appreciate you stopping by! This meal looks absolutely delicious! I'm not familiar with many Irish dishes and definitely hadn't heard of Colcannon. I know we'd like it, so I just may give it a try! you shared at Fridays Unfolded! What an awesome meal to enjoy for St. Patrick's Day. I love the addition of all the vegetables with the brisket. Hope you are having a great week end and thank you so much for sharing with Full Plate Thursday. This looks absolutely amazing! I wish I could some Dallas bbq like that. Unfortunately, the barbeque near me is either subpar or always has a long wait. Not that I mind waiting, but perhaps I should work toward learning how to cook like my own bbq restaurant near me using techniques you have!